Ghostwatch: Behind the Curtains: Well, this is... this is my favourite, I think. Well, this is... this is my favourite, I think. 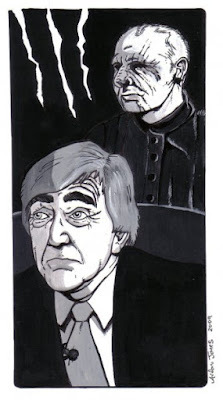 Many thanks to Ghostwatch fan and Behind the Curtains supporter, Arfon Jones, for sending us this truly haunting piece of artwork depicting two of the main stars from the original film - Sir Michael Parkinson & Mr. Pipes. Any more Ghostwatch-themed artwork out there? If so, we'd love to see it! And don't forget... Tonight, BBC Four, 9.00pm. I stumbled across another piece of Mr Pipes artwork today over on Deviant Art that you might be interested in. Head over to http://kmadden2004.deviantart.com/art/Pipes-Is-Coming-For-You-141768987 to see it. You gonna write us a happy ending, Heather..? Ghostwatch back on BBC... nearly.